According to the site www.skyscanner.it these are some of the top European cities to see absolutely during this new year. Cities both big and small but full of attractions. In 2017 this city was awarded the title of “Best European Destination”. Port as well is full of many romantic foreshortenings is known for being a warm city with excellent gastronomy. What to see: the Ribeira district, the Chieda dos Clerigos and the Dom Luís I. What to eat: a bottle of Porto (obviously) and “Bifana” the typical Portuguese sandwich. The charm of the Baroque makes this European city one of the most beautiful cities in Sicily. Ragusa Ibla is UNESCO World Heritage Site also ancient district of Ragusa full of churches and palaces with Baroque architecture. What to see: the panoramic view that can be admired from Santa Maria delle Scale, the Cathedral of San Giorgio and Piazza Pola. What to eat: homemade pasta (squares, cavati or ravioli) with pork sauce, stuffed chicken and tripe. Don’t forget the desserts that are a real pleasure. In 2018, Moscow will host the FIFA World Cup and will be the first city with flying taxis. What to see: the red walls of the Kremlin, the Cathedral of San Basilio and the Cathedral of Christ the Savior. The Tretyakov Gallery, the Bol’shoj Theater and the Pushkin Café are all beautiful. What to eat: a typical Russian dish called “blini”. About an hour from London, Brighton is located along the south coast of England. What to see: this lively town is full of street art, literary cafes and trendy pubs. We suggest you take a walk in the Lanes area. What to eat: lots of street food in every corner of Brighton. It is a city steeped in culture, in fact, until a few years ago it was the capital of culture. What to see: Vieux Port and the many fishing boats. What to eat: desserts prepared with custard and raisins and croissants. Why visit Valencia? For 3 simple reasons: culture, tradition and fun. What to see: Oceanogràfic which is one of the largest marine parks in the world and the Plaza del Mercado, beaches and neighborhoods such as Barrio del Carmen. Even this city is UNESCO heritage site, every year is appreciated by millions of tourists for its mountains, forests, underground and villages. What to see: the Royal Castle of Wawel, the Basilica of Santa Maria, Sukiennice, or the Textile Market and finally the Jagiellonian University, the most long-lived university in Poland. What to eat: barbietole soup, Pierogi (ravioli) and Zurek (a very famous sour soup in Poland). All lovers should jump here during 2018. This city offers postcard views and stunning views. What to see: an island surrounded by an alpine lake that can be reached on board a typical boat. Here you can admire the Church of the Assumption of Mary. As soon as you return to the mainland, visit Bled Castle, if you love trekking, venture out to Grajski Grič hill. What to eat: “Frika” which is a potato and cheese omelette and a slice of Bled cream cake, a sort of “Kinder Paradiso”, but much fresher and softer. Do you like 8 European cities to visit by 2018? If you want to visit one of these, we can give you a hand. 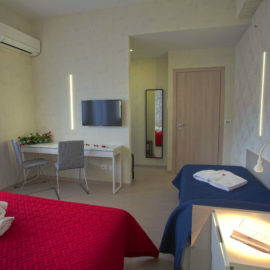 Hotel Kroma is located a few kilometers from Ragusa Ibla and is in a central point for exploring Eastern Sicily. For more information send us an email to info@hotelkroma.it or call us on 0932 622 800.